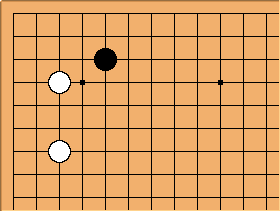 How far should Black extend? Bud Lockett was a 4 kyu in New Mexico who formulated Lockett's Law for extensions: "Always extend an even number of spaces. Then your opponent will not know where to invade." 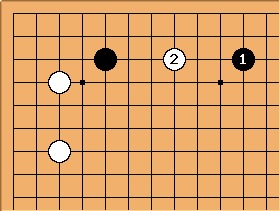 When Black extends to 1, should White invade at a, or b? Is a puzzlement! 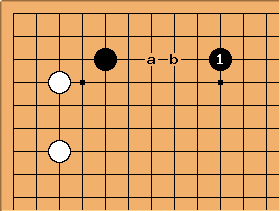 But if Black extends to 1 in this diagram, White 2 is an obvious invasion point. -- cliftut; Funny thing is, there's some truth to this. -- Warfreak2: On the contrary, one should always extend an odd number of spaces. Even extensions leave two obvious invasion points!